Rockland, MA. (December 11, 2017) – Prior Scientific is pleased to announce the launch of its newly designed website. 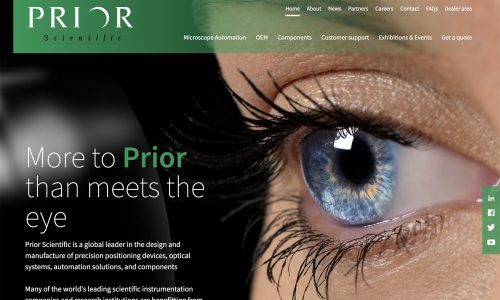 As the global leader in the design and manufacture of precision positioning devices, optical systems, automation solutions and components, we have undergone a full brand refurbishment. We specialize in end to end design from single components to entire systems in microscope automation, OEM solutions and precision components. As the trusted global supplier to all scientific instrumentation companies, Prior Scientific can maximize your ROI while minimizing the upfront cost of design and prototyping. The new website features user friendly navigation, improved functionality, enhanced rich content and a clean uncluttered design. The website will be consistently updated with product launches, business activity, corporate milestones and events. Most importantly, Prior Scientific is recommitted to our customers to provide the highest level of service in the industry. See how we can help you create cost effective Custom/OEM solutions, for your individual requirements. Prior Scientific is the leading manufacturer of microscope automation equipment including high precision motorized microscope stages, automated slide and well plate loaders, LED and metal halide fluorescence illuminators, Piezo Z stages, motorized filter wheels, high speed shutters, custom and OEM electromechanical and optical systems. Prior Scientific works closely with a number of manufacturers of scientific equipment to develop new and innovative products for researchers across a broad range of applications. For further information on OEM development of an application, optimized microscope platforms or related accessories please contact Prior Scientific Inc., at 800-877-2234 or fax 781-878-8736. Write to Prior Scientific, Inc., 80 Reservoir Park Drive, Rockland, MA. 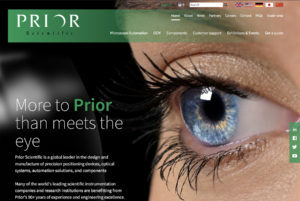 02370, send an email to info@prior.com or visit our website at www.prior.com.